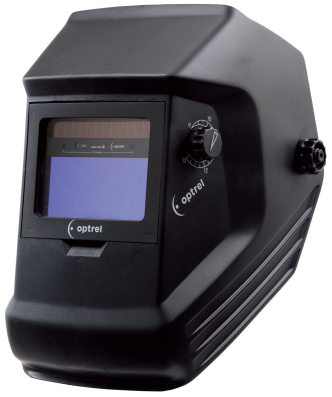 Welding helmet OSC Optrel | Elko G.C. The optrel OSC has been around for a good 20 years and remains very popular amongst loyal customers. The simple, yet ingenious shape of the OSC combined with the fact that the wearer can adjust the DIN 9–13 filter using the continuously variable control from outside the helmet still today offers a very high level of protection and comfort. With a seamless shade level adjustment from DIN 9 to 13, the optrel osc is the perfect solution for all popular welding applications. After shutdown of the welding arc, the ADF momentarily stays closed to protect eyes from the strong afterglow of the welding seam.